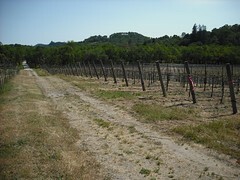 I just came back from visiting Medlock Ames, a winery farm in Alexander Valley, in Sonoma. I first heard about them at last year’s Wine 2.0 event, although they are anything but high-tech – in all the right ways. I was visiting to get some pictures and basic data to use as a test for a small Mapovino demo we are hosting next week, and Medlock Ames is a great example of the kind of geographically specific, sustainable winery that we want to showcase. At first glance, Medlock Ames is well within a trend sweeping many wineries: a sustainably farmed, organic vineyard that has adopted a lot of biodynamic practices to boot. In an oft-repeated reasoning among adopters of biodynamic grape-growing, Ames Morison, grape grower and winemaker for the the winery, said that he wasn’t sure exactly how biodynamic improved things, but it did – the results tended to be better than just using conventional organic farming methods. Wait, I just said “conventional organic.” Wow, see how far along this road we’ve already travelled, where simply “organic” is still not enough? In any case, Ames does pay attention to every piece of the ecosystem. Like any good father, he was up the entire night previous to my visit, monitoring the overnight cold snap that was hitting the region to make sure his new leaf buds didn’t freeze. But that’s to be expected from a premium grape grower. So also, these days, are the owl boxes that act as IPM to reduce mice and other vineyard pests; clover and native Californian grasses acting as cover crop to refuel the soil with nitrogen; solar panels to reduce dependence on fuel. This kind of attention to sustainable farming practices is certainly not ubiquitous, but becoming more and more common among the vineyards of Napa and particularly Sonoma. And Medlock Ames is certainly wild. 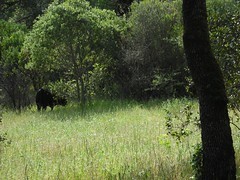 They use sheep to act as natural weed-whackers, but have recently had some “predator problems.” I guessed a coyote. Ames responded that it was probably a mountain lion because of the neck puncture wounds on the dead sheep; coyote tend to gut their prey when they kill it. Huh? This winemaker can identify predators by they way they’ve killed sheep? I felt like I was on a vineyard safari. And that’s when it really hit me – Medlock Ames is really a farm that produces, amongst other things, superb wine. When I mentioned this, Ames related the story from “An Omnivore’s Dilemma” where the dairy farmer actually identifies himself as a grass farmer, because that’s at the root of everything else he produces. Ames feels similarly about Medlock Ames. To complete the safari feel of the tour, I pulled out my camera to capture some brief glimpses of the new small-bred cows they are now testing out to keep weeds and grasses down. These cows, bred in Australia to be heartier eaters across a wider range of environments, are also a bigger match for coyotes or mountain lions than sheep. I could hardly imagine them ambling among the fragile-looking vines, but apparently they do fine as long as it’s not right during the new leaf bud. 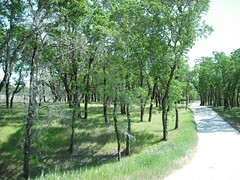 Medlock-Ames produces Cabernet Sauvignon, Merlot, Chardonnay, Sauvignon Blanc, a rosé (only available to club members) and a Bordeaux blend called “Red”. You can get their wines online, or from Bi-Rite Market and Castro Village Wine Company in San Francisco. Thank you for your inspiration, recently I discovered yoga on a holiday in Thailand. I didn’t really plan on it but for some reason did a yoga retreat in a resort called Kamalaya Koh Samui. It was a great experience to practise yoga, and I am so thankful for all the support I am finding. Thank *you*. But perhaps you meant to comment on my yoga-related post? 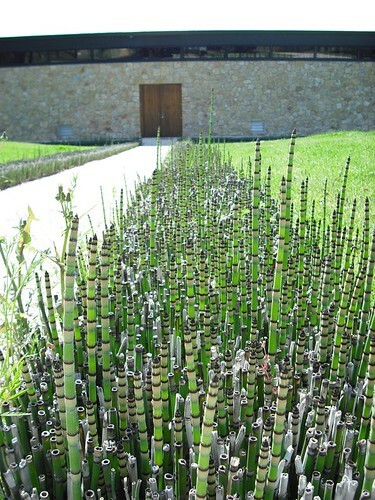 I am really impressed by the beautiful stand of equisetum in the top photograph. It seems to be growing somewhere that is not particularly wet. Did you import it from another location? Do you have to keep it well watered. I once had a fairly decent stand that I started with a few plants I gor from a roadside ditch in Louisiana and tranplanted to Georgia. I planted on the banks of a stream and it did fairly well, but not quite as impressive as that shown in your photo. Keep up the good work.